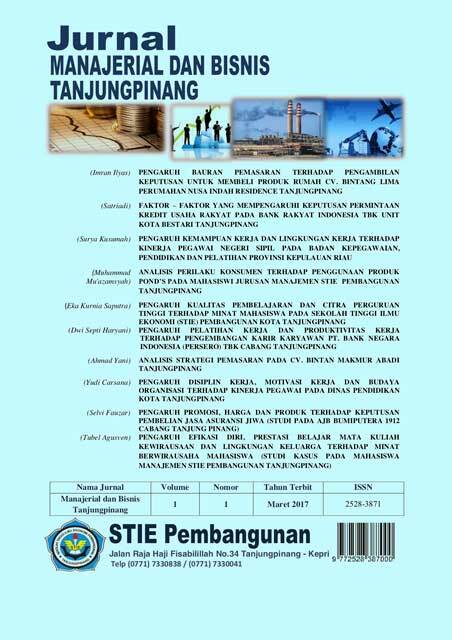 This study aims to determine the factors that affect the sale of agricultural products in the farm market mekar jaya kelurahan toapaya asri, case study on visitors who buy agricultural products in the farm market bloom jaya kelurahan toapaya asri. Number of variables studied are independent variable of product (X1), price (X2), place (X3), promotion (X4) to sales dependent variable (Y). method using regression analysis with sample amounted to 100 respondents taken using simple random sampling technique. The result showed that the coefficient of determination (R square) was 0.815. the contribution of product variables, price, place and promotion to sales is 81,5% (0,815 x 100%) while the remaining 18,5% is influenced by other factors not in carefully.